For meritorious achievement while participating in aerial flight or for a single act of heroism against an armed enemy. 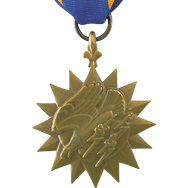 Established in 1942, the Air Medal is awarded for meritorious achievement in aerial operations, for heroic acts in aerial operations against an armed enemy, or for merit in operational activities. During the Vietnam War, for instance, a single award of the Air Medal denoted participation by ground troops in a requisite number of "Combat Air Assaults".